- Borrow from friends: Want to start a garden from scratch but don’t have a tiller? Instead of dropping hundreds of dollars on a tiller, ask around! Your friends, family, or coworkers may already have one. If not, check equipment rental places; they may have a tiller for you to rent, as opposed to buying. - Buy seeds, not plants: While it’s easier to buy plants, it’s much cheaper to buy seeds. There are other advantages to this as well; you get more variety in seeds, and some varieties you can’t buy as plants because they don’t transplant well. Plus, there seems to be this aversion to planting seeds because growing something from seeds seems to be tantamount to scaling Everest, based on what I hear from some people. Not true! Many types of plants are quite easy to grow from seed. 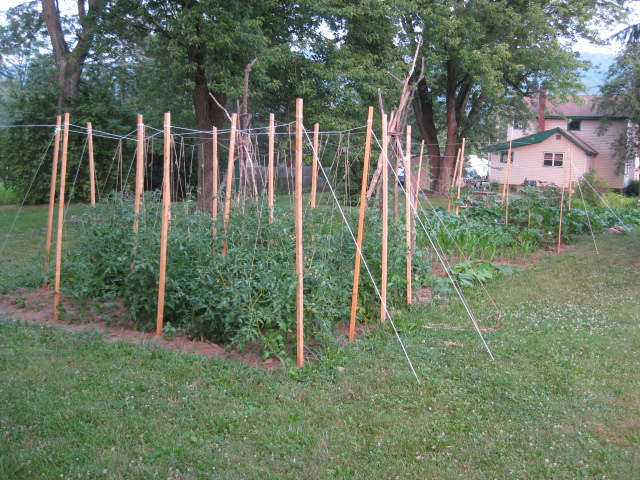 - Use homemade plant supports: Trellises, tomato cages, etc. all can add up to a pricey trip to your local garden center. However, you can make many supports. You can find 2x2 furring strips at Lowe’s/Home Depot for about $2 a piece, much cheaper than the supports they sell in the garden center. Furring strips combined with dollar store clothesline can be used to create a Florida weave for tomato supports that can support multiple plants. You can also use furring strips and twine to make your own trellis for cucumbers and other vine plants. - Save seeds: If you grow open-pollinated or heirloom varieties that are not hybrids, you can save seeds. It’s pretty easy, and you can find information on how to properly do it online for most varieties. There are challenges for some vegetables such as cross-pollination. - Free fertilizer: Buying fertilizer/garden soil can really add up. Once you have your garden established, it still needs the soil to be replenished each year. However, you can have a healthy garden with great soil for free by using your own compost. Create a compost pile in a corner of your yard, and by turning it and adding to it, you can have all the compost you need. Also, it’s a good idea to dump your grass clippings into the garden. Along with being a mulch that prevents weeds, the grass breaks down and feeds future garden plants.